A unique A4 sized numbered original printed certificate. The certificate will show the stock item number from our official company records so the item of memorabilia can be easily traced for any future reference. The certificate description will be filled out and signed by hand so that it cannot be re-printed or forged. Rest assured we will have fully researched the authenticity of any autograph and checked that any included known history and provenance correctly corresponds. The vast majority of our autographs are purchased from private individuals in their raw state who themselves or a member of their immediate family obtained / collected them in-person. This enables us to pass on this interesting and valuable information to the buyer. 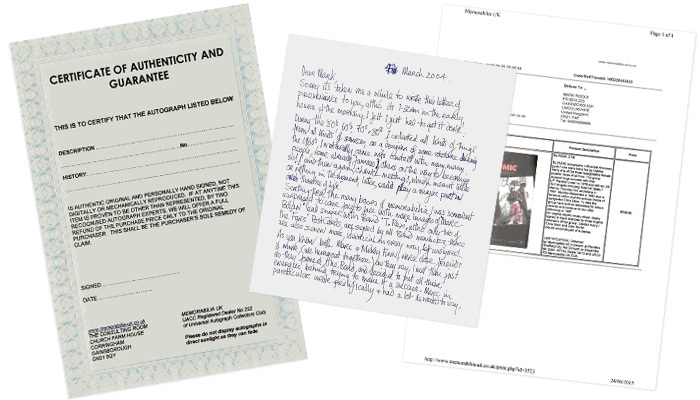 CERTIFICATES of AUTHENTICITY (or COAs as they are often called) are a much misunderstood area for non-experienced autograph buyers. Do please understand that a COA is only ever as good as the issuer. Most certificates we see issued by unregulated dealers trading from Internet Auction sites are completely worthless. They are just printed off the internet, the wording of them is vague and they usually have no official contact details on. In the event of a customer making a complaint or questioning authenticity who can they actually contact and are they likely to still be in business the following year? In truth a certificate is really an opinion, a record of sale and unless it has been issued by a known, trusted & respected registered autograph authority it is not going to carry much weight in the future. We would always advise purchasing only from UACC & AFTAL Registered Dealers as their credentials and their COAs should be recognisable to most educated buyers and auction houses. It is important also to remember that as dealer members within these respected autograph clubs, any customer feeling that they may not have been treated properly or with the respect they deserve has if necessary an additional avenue of complaint to the main boards of these associations. 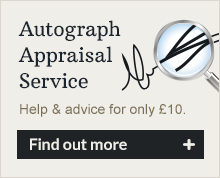 FOR MORE ADVICE on all aspects of what to look out for when purchasing autographs please visit our Advice and Certification sections.